PCSchool realises that each school is different. The unique structure enables total control of the screen and report formats providing an intuitive interface readily understood and used by staff. We appreciate that it is our responsibility to fit within your assessment requirements, whatever form they may take. Outcomes, Criteria or National Standards based assessment as well as all the traditional methods, External reporting or Internal performance audits. Supports interactive reporting between teachers, parents and students. This immediate two way communication flow over the web is an ideal way to motivate and engage Generation ‘Y’ and Generation ‘Z’ resulting in better learning outcomes. Use numerics, check boxes, radios, validation dropdown lists, continuums, comment banks or free form comments (spell checked by an English dictionary). PCSchool is the only package with XML-Format, providing unprecedented freedom and flexibility. Review the total history of a course of study. show students progress on Caregiver report cards, comparing performance to prior years and / or to “expected” outcomes of their peers. Print Student Profiles indicating performance across their whole life at the school. Graphically analyse results across classes and/or year levels. Compare results based on properties such as Gender or Ethnicity. Development & management. Locate students instantly – teacher replacement rosters in minutes. 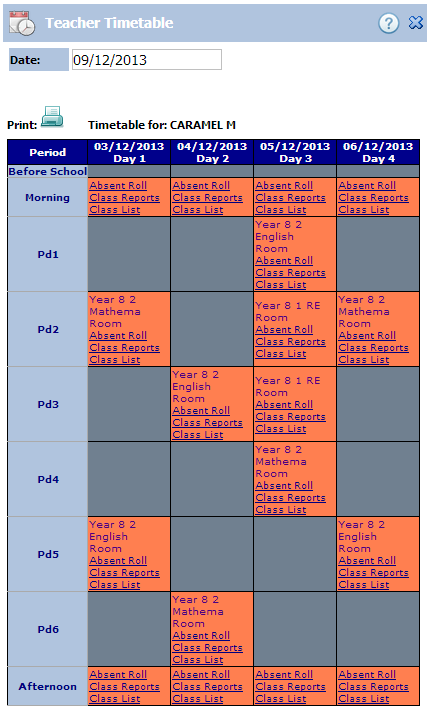 Private spreadsheet style teacher mark books accessed at school and over the internet. Export to Excel or selectively import directly into PCSchool. Teachers save time with improved accuracy.